SAGE India Digest: Alone Together! What do we choose to forgo in preference to being constantly connected? As we can only focus on one thing at a time when we choose to be connected we also temporarily disconnect ourselves from our immediate physical surroundings. This leads to negative effects. Rosellina Ferraro, assistant professor at the University of Maryland, has conducted a very interesting study showing that smartphones decrease our involvement in society and our interest in and empathy for other people. According to Ferraro, the mobile phone has become a “comforter” that provides us with the confirmation we need to feel good. Her research shows that people become more egoistic when they are constantly connected and using smartphones. It is not the mobile phones themselves that make us egoistic, but the fact that we tend to shut ourselves inside our own social universe with the help of our connected smartphones. This can lead to our relationship with our phones becoming more important than the people in our surroundings. through the stationary computer. To ensure that the conclusion was not a coincidence, Ferraro conducted several similar surveys in which all gave the same result. The potential of democratization, community, and access to all the knowledge in the world, in your pocket—there are obvious fantastic opportunities to be had with what the constant connectedness brings. But the question is how to really harness this enormous potential without suffering the negative side effects. Our recently published book 'Connected Disconnected' will advise you on how to handle the challenges constant connectedness poses to our wellbeing—sleeping patterns, close relations, work-life balance, and parenting. It does not discuss whether this is a threat or an opportunity for us, because it is both. 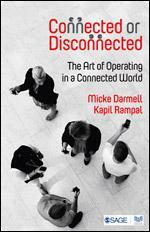 To learn the art of Operating in a Connected World, grab your copy now!